What source of sulfur is right for you? Selecting the right source of sulfur is critical to ensure enough sulfate-sulfur is present in the soil at key uptake periods. Rapid uptake of sulfur occurs in corn from V5 to early silking when 50 percent of sulfur needed by corn is taken up. Roughly 10 percent of sulfur needed by corn is taken up prior to V5, but this timeframe is still critical and deficiencies early in the growing season can limit yield – particularly in cool and wet springs. Sulfate fertilizer sources like ammonium, potassium and calcium sulfate will provide readily available sulfate to a corn crop. The drawback of these materials is that sulfate can leach through the soil profile immediately after application. While it is possible to leach sulfate, research in Minnesota has demonstrated that sulfate can carry over in medium- to fine-textured soils and be in the soil profile that fall and even the year following application. Fall application of sulfate can still provide available sulfur to the crop the following year. Some who wish to apply sulfur in the fall have preferred elemental sulfur. Elemental sulfur is not plant available and must oxidize to sulfate to be taken up and used by the corn crop. The oxidation process is highly impacted by soil temperature, which will be very slow and may not occur in fall after application or the following spring until soils sufficiently warm near the start of summer. To be effective, elemental sulfur oxidized later in growing season must result in greater soil sulfate-sulfur concentrations that carry over to subsequent years. 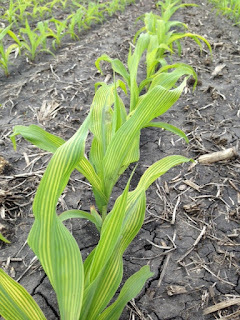 There may be situations where sulfur deficiency will occur after elemental sulfur is applied. In these cases a sulfate sulfur form can be applied through the V5 growth stage and still have maximum yield potential. There are multiple sources of elemental sulfur that claim to have better availability. The primary mechanism to make elemental sulfur available to crops is controlled by climate, which can lead to unexpected deficiencies. Some striping is expected in early spring even in fields were sulfate sulfur is applied. If the upper leaf of the plant shows faint yellow strips along the mid-rib, there likely is nothing to worry about. If there are very noticeable yellow strips on the majority of leaves on the plant, consider a side-dress application of sulfur. Thank you to the Agricultural Fertilizer Research and Education Council (AFREC) for providing support for this project.